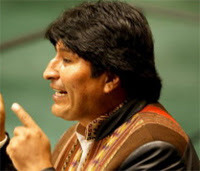 Bolivia Rising: "Let’s respect our Mother Earth"
"Let’s respect our Mother Earth"
Letter from President Evo Morales to the member representatives of the United Nations on the issue of the environment. Sister and brother Presidents and Heads of States of the United Nations: The world is suffering from a fever due to climate change, and the disease is the capitalist development model. Whilst over 10,000 years the variation in carbon dioxide (CO2) levels on the planet was approximately 10%, during the last 200 years of industrial development, carbon emissions have increased by 30%. Since 1860, Europe and North America have contributed 70% of the emissions of CO2. 2005 was the hottest year in the last one thousand years on this planet. Different investigations have demonstrated that out of the 40,170 living species that have been studied, 16,119 are in danger of extinction. One out of eight birds could disappear forever. One out of four mammals is under threat. One out of every three reptiles could cease to exist. Eight out of ten crustaceans and three out of four insects are at risk of extinction. We are living through the sixth crisis of the extinction of living species in the history of the planet and, on this occasion, the rate of extinction is 100 times more accelerated than in geological times. Faced with this bleak future, transnational interests are proposing to continue as before, and paint the machine green, which is to say, continue with growth and irrational consumerism and inequality, generating more and more profits, without realising that we are currently consuming in one year what the planet produces in one year and three months. Faced with this reality, the solution can not be an environmental make over. I read in the World Bank report that in order to mitigate the impacts of climate change we need to end subsidies on hydrocarbons, put a price on water and promote private investment in the clean energy sector. Once again they want to apply market recipes and privatisation in order to carry out business as usual, and with it, the same illnesses that these policies produce. The same occurs in the case of biofuels, given that to produce one litre of ethanol you require 12 litres of water. In the same way, to process one ton of agrifuels you need, on average, one hectare of land. Faced with this situation, we – the indigenous peoples and humble and honest inhabitants of this planet – believe that the time has come to put a stop to this, in order to rediscover our roots, with respect for Mother Earth; with the Pachamama as we call it in the Andes. Today, the indigenous peoples of Latin America and the world have been called upon by history to convert ourselves into the vanguard of the struggle to defend nature and life. I am convinced that the United Nations Declaration on the Rights of Indigenous Peoples, recently approved after so many years of struggle, needs to pass from paper to reality so that our knowledge and our participation can help to construct a new future of hope for all. Who else but the indigenous people, can point out the path for humanity in order to preserve nature, natural resources and the territories that we have inhabited from ancient times. We need a profound change of direction, at the world wide level, so as to stop being the condemned of the earth. The countries of the north need to reduce their carbon emissions by between 60% and 80% if we want to avoid a temperature rise of more than 2º in what is left of this century, which would provoke global warming of catastrophic proportions for life and nature. We need to create a World Environment Organisation which is binding, and which can discipline the World Trade Organisation, which is propelling as towards barbarism. We can no longer continue to talk of growth in Gross National Product without taking into consideration the destruction and wastage of natural resources. We need to adopt an indicator that allows us to consider, in a combined way, the Human Development Index and the Ecological Footprint in order to measure our environmental situation. We need to apply harsh taxes on the super concentration of wealth, and adopt effective mechanisms for its equitable redistribution. It is not possible that three families can have an income superior to the combined GDP of the 48 poorest countries. We can not talk of equity and social justice whilst this situation continues. The United States and Europe consume, on average, 8.4 times more that the world average. 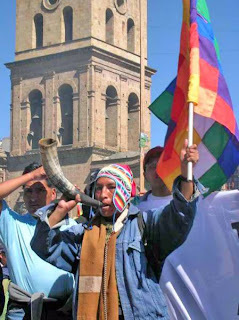 It is necessary for them to reduce their level of consumption and recognise that all of us are guests on this same land; of the same Pachamama. This is by far one of the most insightful and intelligent speeches I have read by anyone in a very long time. Congratulations to Señor Presidente Morales and best wishes to his lovely nation. May we all be free of the scourge of capitalism! Everything Morales said is absolutely right. Capitalism is destroying our planet with its greed, consumption and inequality. I have never read anything about Morales but after reading this I truly start admiring him. Such an insight. From what I read about him now, he is not just talking a talk but walking a walk. But even his words are pure gold. I wish we had more such leaders. Viva revolucia! I believe there is a myth that exists that capitalism is automatically evil. Inflamatory statements such as "capitalism is destroying our planet" is similar to saying guns and bullets kill people and are therefore bad. Take a look at the result of comumnism in Europe (the supposed answer to the evils of capitalism). Corrupt leaders of countries like East Germany, Bulgaria, Poland and others literally raped the country of its resources, leaving very little to the people it supposedly served. I would like to respectfully suggest the problem is with those behind the system (whatever it is) who have no compassion or morality with respect to how they conduct busness. It is possible to successful in a capitalistic society and still exhibit compassion and a conscience - even though these qualities are often rare in business. I wonder how many people who stand up and wave the flag or banner against evil capitalism or evil countries are currently expending as much or more energy and money trying to make a difference in a world where many of these people are often exploited. Actions speak louder than words.